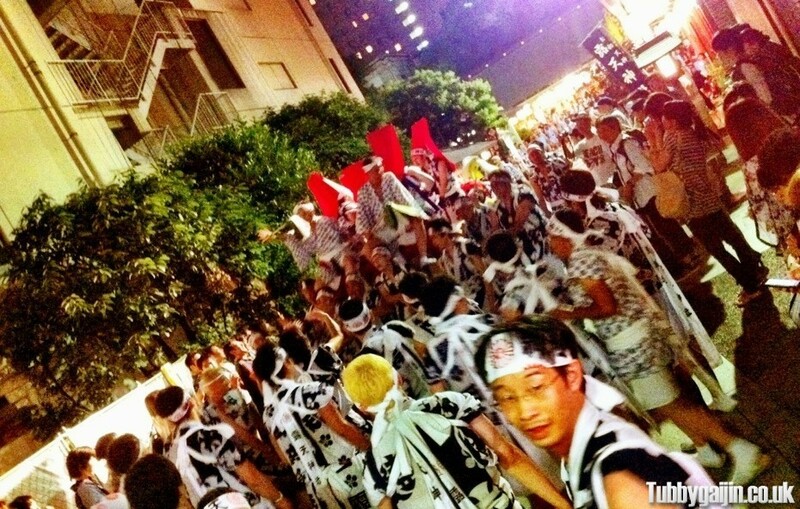 Last night, Emma and I were walking back to our hotel from Osaka station when the sound of shouting and beating drums in the distance caught our attention. This led us to Tsuyonoten Shrine(sometimes known as Ohatsu Tenjin Shrine). It was part of their Great Annual Festival, which drew to a close yesterday. We stood and observed for a while as a small group of people, including musicians, sitting on a large rolling float were pulled to the entrance of the shrine, and then after a short break they were pushed back in the other direction at speed accompanied by much shouting. It looked very tiring, during our ten minutes of looking on this was repeated at least 5 times, and goodness knows how long they’d been going beforehand! A very random, but fantastic thing to happen upon at the end of a day! but you seem to capture the special events even veterans fail to witness. Thanks man, I appreciate it 🙂 I know my writing is pretty far from Shakespeare, but I still enjoy doing it! It was definitely blind luck that I saw this event, I’ve had a few situations like that this summer, Ito was probably the best – hundreds of illuminated coloured lanterns floating down the river towards the sea, beautiful.